Spring salad. ….Two little words that conjure up images of exactly what I’m craving this time of year: the light and fresh greens—and green vegetables—of the new season at the farmers’ market. I have been visiting my Farmers’ market now for almost a month. 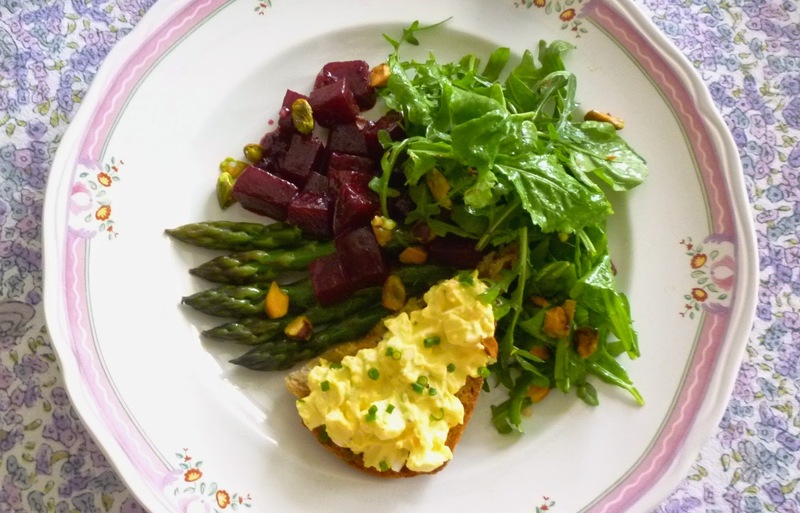 And although the offerings are still a bit thin, I have been able to find all of the ingredients I need to make one of my favorite spring salads….arugula with beets and asparagus. 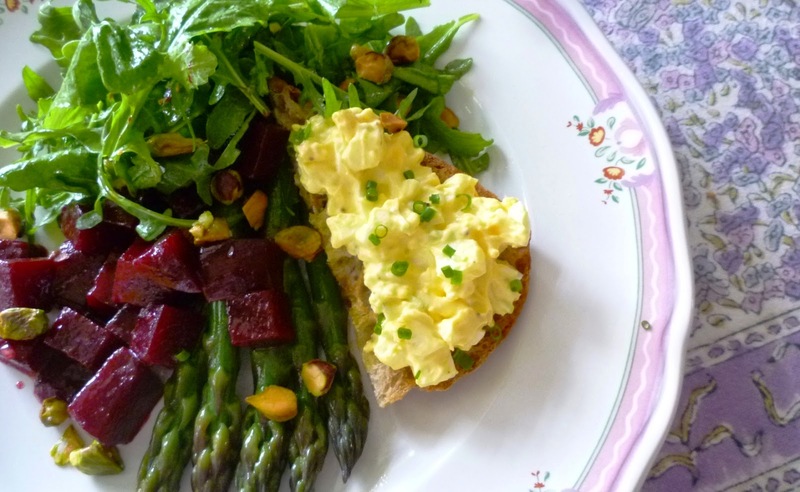 I first ran across this unusual combination of beets and asparagus years ago in an article in Bon Appétit featuring representative dishes from the various regions of the French countryside. I have made this salad many times over the years…and I am always struck by how good it tastes. If you are dubious, I encourage you to give it a try. The original salad included hazelnuts…but I sometimes replace them with walnuts or pistachios. Often I add olives…or goat cheese…but the salad is delicious without them. I don’t remember what kind of vinaigrette was on that original salad, long ago I discovered that an orange vinaigrette (and a handful of fresh mint) lights up this flavor combination better than just about anything else. You can make an orange vinaigrette with fresh orange juice and orange zest, but you get a more intense flavor…and better emulsification….if you reduce the orange juice down to a thick syrup. 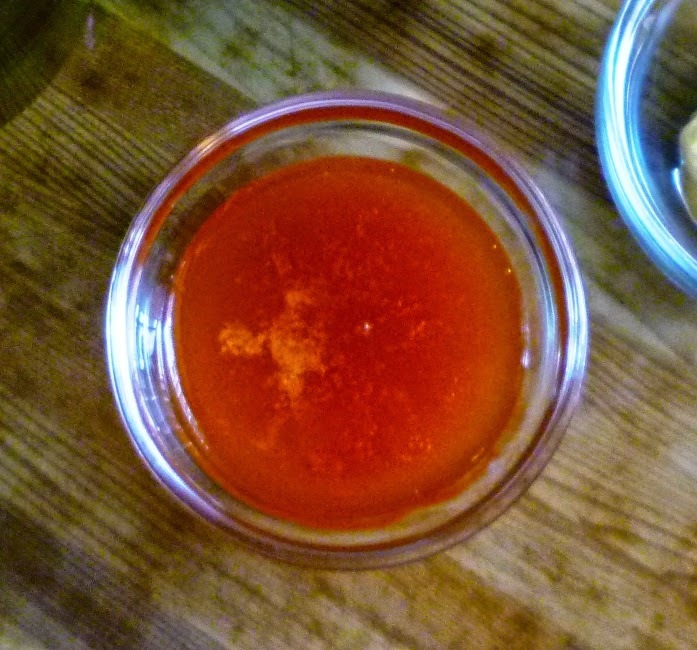 Reducing the juice is easy…it just takes a bit of patience. The temptation to boil it rapidly is great, but usually results in a scorched or caramelized reduction. 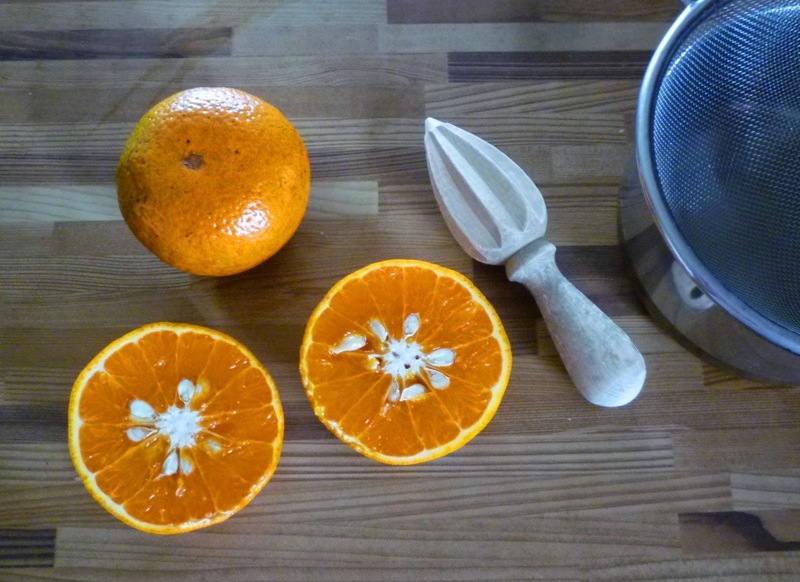 The best results are achieved by bringing the orange juice to a boil and then reducing the heat to very low and patiently letting the juice reduce. The liquid doesn’t really even have to simmer…it just needs to steam. Occasionally, run a heat proof rubber spatula around the sides and bottom of the pan to make sure that none of your precious reduction is sticking to the sides and burning. Your goal is a thick syrup….you will get a generous 2 tablespoons of reduction from 2/3 to 3/4 of a cup of fresh juice. Towards the end of the cooking, watch it very carefully—even over low heat, it will eventually scorch if allowed to cook too long. When I made this salad last week, I was unable to find Valencia oranges....which I prefer because they produce abundant, sweet juice. Instead I purchased a couple of Honeybell tangerines (also known for their abundant, sweet juice). The tangerine vinaigrette was excellent. Since the availability of citrus fruits is quite variable this time of year, you should purchase whatever member of the orange/tangerine family you are able to find that is juicy and sweet. When you make the vinaigrette, take the time to make a full batch. Since it is delicious on all kinds of ingredients (not just beets and asparagus), I can’t imagine that it will go to waste. Shaved fresh fennel…raw and cooked carrots….poached artichokes…fresh peas…. all are delicious dressed with this vinaigrette. The vinaigrette itself takes well to all kinds of additions and variations. Sometimes I add Dijon… sometimes a few minced shallots or spring onions. As far as the choice of vinegar is concerned, you have many options. I prefer something with a lighter color—champagne, white wine, white/golden balsamic…or, going a bit darker, sherry. But a little red wine vinegar…or even a small amount of balsamic would be fine. 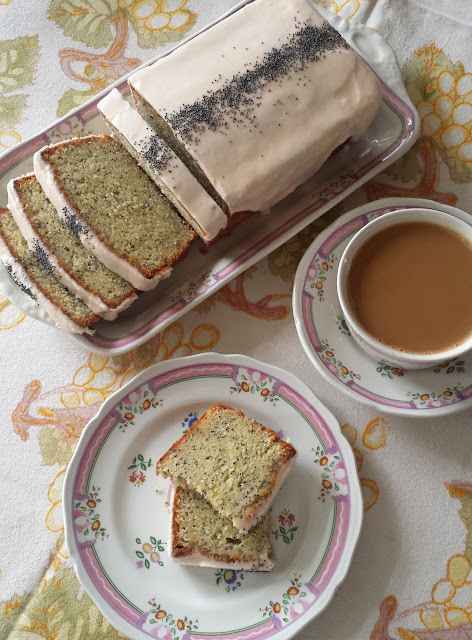 Minced fresh tarragon and mint are nice additions too…as is a little toasted and ground fennel or coriander seed. When I made this salad last, I had intended to serve it garnished with a few wedges of hard cooked egg. (I had on hand some very fresh eggs—a lovely gift from a couple of women who attend my classes and who keep a flock of hens.) But while the eggs were cooking, I decided I wanted something more substantial, so I made egg salad instead…and spread it on crisp little toasts. It was the perfect touch. I would give you the recipe….but I honestly don’t have one. I have been making egg salad since I was tall enough to reach the counter. I never measure….and I still make it the same way I always have…chopped hard cooked egg, enough mayonnaise to make it creamy, and mustard, salt and pepper to taste. At some point in time I graduated from yellow mustard to Dijon…but it is delicious either way. This last time, I added a smidge of minced spring onion…and a sprinkle of chives. Although neither is necessary…egg salad should be all about the eggs. I love this time of year. The light… the colors… the new growth all around… and the beginning of the market season. If you have not made your way to your market yet, I hope you will soon. You can’t help but be inspired. While you’re there, be sure and pick out some beautiful greens….mint (if you don’t have your own little patch)…some asparagus….a few beets….and some local eggs…. Preheat the oven to 400°. Place the beets in a roasting pan and add a quarter inch of water. Cover the pan with foil and roast the beets in a pre-heated oven until they are tender all the way through—30 minutes to an hour, depending on the size and age of the beets. When the beets are cool enough to handle (although they should still be a bit warm), trim the roots and stems off and gently rub the skins off using a paper towel. Leave baby beets whole; cut medium-sized beets in wedges; dice large beets. Toss the beets with red wine or balsamic vinegar to taste. Set aside. To serve the salad: Treating each separately, season the beets and asparagus with salt and pepper and dress with the vinaigrette. Arrange attractively on individual plates or a platter. Place the arugula and mint leaves in a bowl. Drizzle with some of the vinaigrette and season with salt & pepper. Gently toss to make sure all of the leaves are lightly dressed with the vinaigrette—add more vinaigrette as necessary. 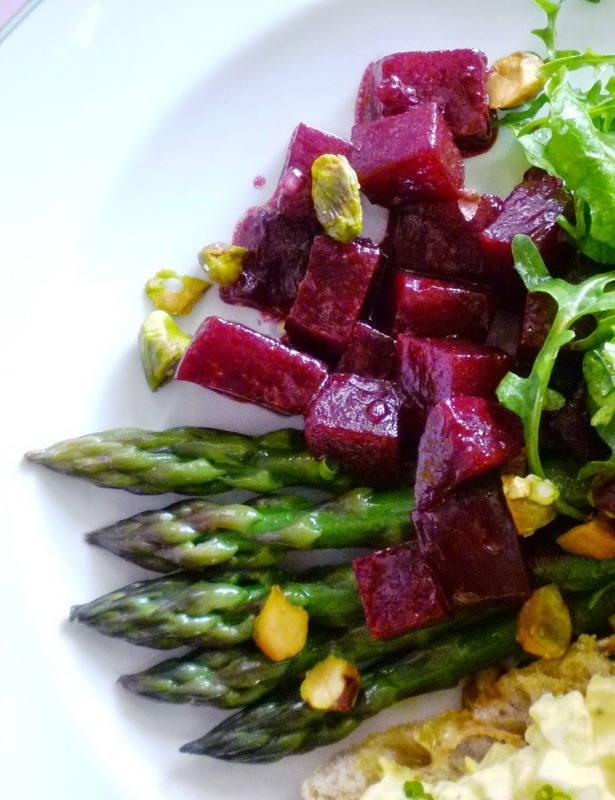 Arrange the dressed greens, on the plate(s) with the beets & asparagus. Sprinkle the toasted pistachios over all. If you have never roasted beets for a salad before, there is a more detailed description of the process here. Similarly, you can find out how I hard cook an egg in this recent post. If you would like a printable recipe for my basic egg salad (outlined above) you can find it here. In a small bowl, combine the vinegar and shallots. Season to taste with salt & pepper. Let sit for a few minutes (to soften the shallots). Whisk in the mustard and reduced orange juice. Gradually whisk in the oil, adding it in a thin stream. Taste and correct the seasoning and the vinegar balance.